Less than 3 months off the heels of SHOGO:Mobile Armor Division, Monolith has just done something unprecedented in the FPS shooter biz - immediately released another title. 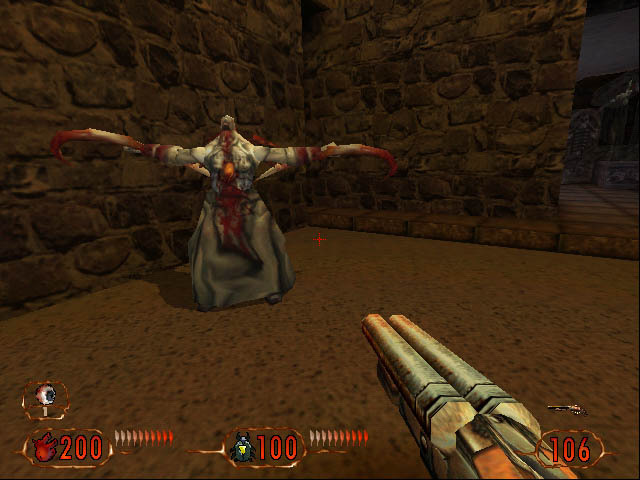 Blood II, developed concurrently with SHOGO, is using the classic LithTech Engine, but shows the result of constant evolution on the technical as well as the gameplay end of things. Like all standard first-person-shooter games, Blood 2 has some semblance of plot or storyline, just ta get you pumped up and ready to kill. You are Caleb, undead wanderer (and the god-killing badass from the original Blood). Having thoroughly gutted the ancient god Tchernobog (who has evidently died 15 times earlier since the history of history), you've been content to sit back for a few decades in a semi-retired state. The Cabal however, have other plans. These guys are the cult of Tchernobog, and have through the years pooled their investments into a burgeoning multinational, "Cabalco" (gee…who would've guessed?). They're big, they're powerful, and they have influence everywhere. Now they want you dead, so that their god can live again. Bummer, except for the fact that as Caleb, you love a good fight, especially if it involves gutting and/or immolation. Before delving any deeper into the game, it would be good to note that Monolith has promptly released Patch 1.01 for Blood 2, addressing many single-player issues that have cropped up since release. As with all new games, bugs are inevitable, and kudos to Monolith for responding so quickly. In case you haven't noticed, I've basically given up hope on having a game ship bug-free. Here is a full list of changes, and you can find the patch and more info at www.the-chosen.com.